HOUSTON -- One of the most talked about moments at the Texans game on Sunday didn't even involve any of the players. Army Specialist Robert Hadden surprised his wife, Samantha, and son, Brexton, at the Texans Jaguars game. When Samantha realized her husband would be home for Christmas, she rushed to give her husband a huge hug. We have video of the heartwarming moment from two different angles. 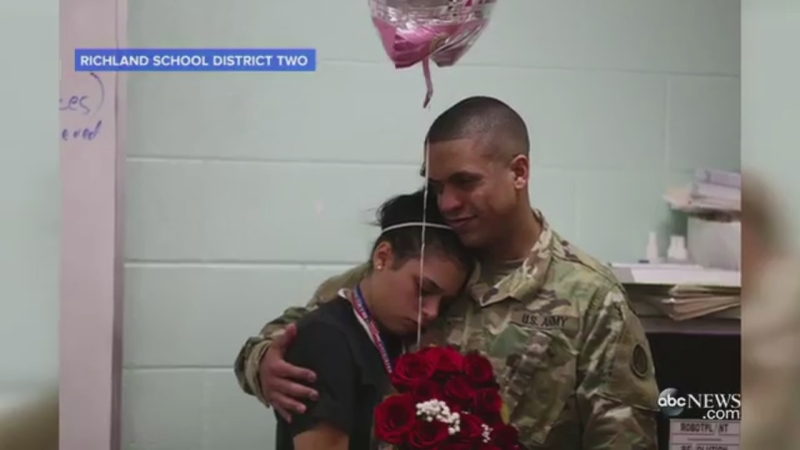 A military father came home a week early and surprised his daughter in her classroom at a South Carolina high school. A U.S. Marine sergeant, who hadn't seen his mother in person in two years, surprised her by showing up to elementary school where she teaches. Watch more soldier surprise videos here.